Short-tailed Albatross (STAL) on the rise! This entry was posted in Uncategorized and tagged Conservation, Japan, Tubenoses on August 30, 2012 by coasst. This entry was posted in Uncategorized and tagged Marine Debris on August 25, 2012 by coasst. Debris trash bins to be redeployed as debris increases in fall – check out this news release. This entry was posted in Uncategorized and tagged Marine Debris, Washington on August 24, 2012 by coasst. Citizen Science gaining acceptance and credibility – check it out! This entry was posted in Uncategorized and tagged Citizen Science, Volunteer on August 14, 2012 by coasst. This entry was posted in Uncategorized and tagged Conservation, Seabird, Washington on August 4, 2012 by coasst. Citizen Science! A bit of COASST in the news. This entry was posted in Uncategorized and tagged Citizen Science, Conference, Oregon on August 4, 2012 by coasst. Feisty young pelicans are roughing up nesting murres at Yaquina Head off the coast of Oregon. They are not only stirring up the adults and preying on the chicks, but they are also physically shaking the chicks until they regurgitate their last fish meal for the pelicans to consume. Researchers from the Hatfield Marine Science Center believe the acts may be a result from a lack of food in the ocean. Associate Professor Robert Suryan, observed that brown pelican disturbances are normal, “but none have been this extensive”. “We observed juvenile pelicans eating chicks, shaking chicks until they regurgitated fish meals and then discarding the chicks to eat the fish, and eating any fish parts that were on the rocks,” Suryan wrote in a report on his surveys. The turmoil from the intrusions in the populations have therefore lead to more opportunities for gulls and corvids to have their fill of unattended chicks and eggs. It also results in a large number of chicks accidentally being pushed off the rocks too early, leaving them to drown or get pummeled by rough surf. Hundreds of chicks are washing up on nearby beaches after being shoved off rocks prematurely. According to Cheryl Horton, who has been monitoring the murres that nest at Yaquina Head, said the pelican attacks are part of the natural order, but are rather unusual off the Oregon coast. She claimed that the weirdest part about these events was how the pelicans were shaking the chicks to get the fish. This is new to this site along with the large number of chicks being washed up. Another dominant predator to the murres are the Bald Eagles. 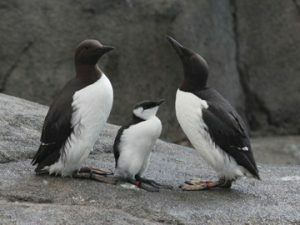 With their increasing populations, some murre nesting communities have completely abandoned their sites over the past decade. Horton is currently looking for a way to monitor the effects of these predators on murre populations. Despite their high population numbers, the lack of nesting sites may affect their ability to produce as many chicks as they have in the past. Click here to watch a video of a pelican intrusion, courtesy of Cheryl Horton. Read more on this topic Here. This entry was posted in Uncategorized and tagged Murre, Oregon, Pelican on August 2, 2012 by coasst. Who are the COASST Interns? Receive an email when we update our blog. Unsubscribe anytime! Personally Identifiable Information is not collected: contact Jackie Lindsey (EU GDPR Controller) with questions.